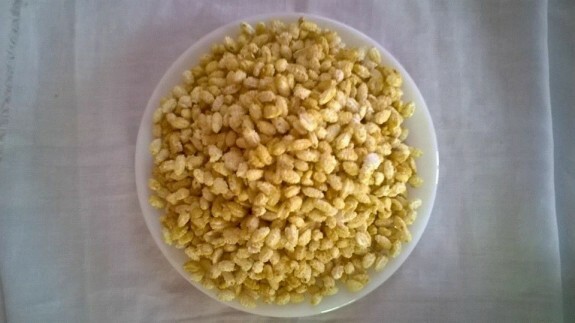 Murki is made from a special puffed rice or Khoi in Bengal with Jaggery or Gur. Here is how Bengali prepares this sweet in home. 1. Heat a Kadai or pan and add ½ cup water and gur into it. 2. Stir it continuously in low heat until it gets sticky and sticks on the back of the ladle. Also, you can take water in a small bowl and pour a drop of gur into it. If it drops down on the end of the bowl, then your gur is ready. 3. Take out of flame and keep it aside for few minutes until it little cold. 4. Pour it in the Khoi or Puffed Rice and mix well. 5. You can keep the Khoi in two different big plates so that it could be easier to mix the gur properly with the Khoi. 6. Keep this in a tight container.